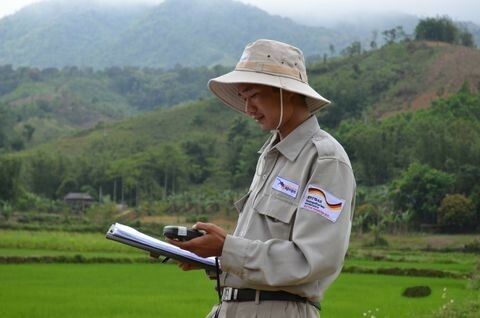 Through co-development of standard procedures and survey tools, APOPO helped provincial partners build their capacity for evidence-based UXO clearance towards the long term aim of elimination of unexploded ordnance (UXO) contamination in Vietnam. With the support of the German Federal Foreign Office (GFFO) in 2014, APOPO contributed to the clearance of UXO contamination and neutralizing its impact on the livelihoods of the affected population in Vietnam. The specific aim of the project was to work with local stakeholders to develop capabilities within the Vietnamese system, in order to foster self-reliance needed to eliminate explosive remnants of war (ERW) contamination, now and in the coming decades. Through co-development of standard procedures and tools to survey contamination and by establishing systematic information collection and database units, APOPO helped provincial partners build their capacity for evidence-based UXO clearance. The project also enhanced the capacity of the APOPO staff to independently prioritize, plan, implement, coordinate, and monitor mine action activities within their area of operation. Vietnam is one of the most heavily bombed countries in the world, leaving about 21% of the country contaminated with aircraft bombs, cluster munitions and explosive shells that were dropped or launched, yet failed to detonate during the Vietnam War (2nd Indochina War). Main targets were major infrastructure sites and transportation routes as well as civilian and battlefield areas, and vast tracts of the uplands where the Ho Chi Minh Trail ran. As a result, access in rural areas to safe, arable land is greatly restricted, negatively impacting the ability of subsistence farmers to escape deep poverty. Since the end of the war (1975), at least 104,973 casualties have occurred: 38,980 killed and 66,033 injured by mines and UXO and even today, many rural communities find their livelihood activities greatly restricted by this legacy, both in terms of access to land and the burdens of disability. APOPO Vietnam was operational in two of the countries’ most heavily landmine/unexploded ordnance (UXO) contaminated regions: Quang Tri and Thua Thien Hue provinces. Although widespread, the contamination in these regions is not consistent in concentration and type. Some areas are highly affected by ERWs, while other areas are little affected or not affected at all. APOPO employed an evidence-based and documented approach to accurately identify hazardous area (progressive baseline survey methodology). Using faster and more economical survey methods ensured that only parts with a proven contamination are cleared and technical resources are used more efficiently and effectively. In both Quang Tri and Thua Thien-Hue provinces, APOPO worked together with the Department of Foreign Affairs and Provincial Engineering Command. These agencies are responsible respectively for the oversight and coordination of humanitarian mine action projects and the identification and elimination of explosive hazards. The project also ensured close linkage to the grass roots level as APOPO was operating through a network of commune focal points conducting UXO reporting and mine risk education. APOPO's project in Vietnam was completed in August 2014 and APOPO no longer has a presence in the country.